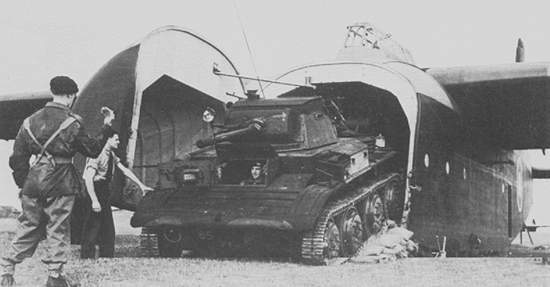 " The role of the Light Tank Squadron will normally be the capture of an objective, in anticipation of a quick follow up by part of the Airborne Division, followed by patrolling in front of the main position.<o:p> It was agreed that the likelihood of heavy opposition would entail the withdrawal of the Squadron "
That was the role laid down in the unit manual but in fact the Unit used its tanks to defend troops against heavy enemy opposition and led the way of all British troops into Germany against the best enemy units. Initially; the unit appeared to have three Squadrons. Namely; ' A ' (light tank Sqn) with 5 troops each with 4 tetrarch tanks, ' B ' (Recce) consisting 4 troops with scout cars and carriers, a ' blitz ' (infantry support) troop on motorcycles and 2 troops of armed with 3" mortars. ' HQ ' Squadron had 4 more Tetrarchs, REME, MEDICS, Signals, a re-supply unit and 2 troops each with 4 Vickers MMGs. Regimental HQ also had 2 Tetrarchs. On D Day a small " Harbour Party " consisting 1 Officer and 15 men flew in with the advance Pathfinder Parachute Unit to secure the Regimental landing ground. Unfortunately; this unit lost its Officer and one stick of men on landing. 20 light tanks and other carriers and vehicles flew in with the second main lift from Tarant Rushton in 30 Hamilcars while others flew in from Brize Norton in Horsas. 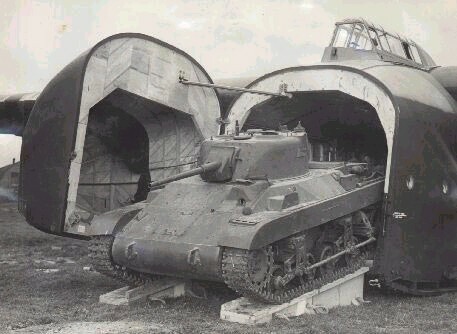 Some Tanks were lost due to a crash on landing and for a while some tanks were disabled due to parachute canopies and rigging getting wrapped round the tracks which had to be burnt off. After 10 days the Unit was withdrawn but the tank units went straight back in their tetrarchs to support the remaining hard pressed ground troops. Once again; the tank crews were withdrawn but after 10 days re-training went back in with Cromwell tanks and continued supporting the breakout. The Unit was taken out of the line at the end of August and by 6th Sept had re-grouped at Larkhill. There the Unit was enlarged to a Regiment of 4 Squadrons with a compliment of 32 officers and 326 other ranks. 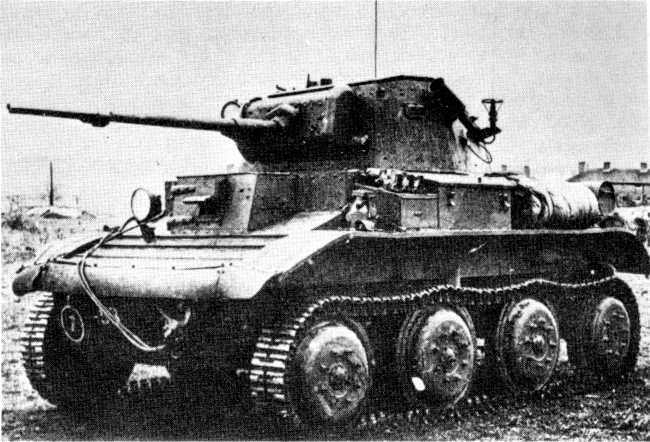 The 2 Recce Squadrons each had 4 Locust tanks when airborne or Cromwells otherwise and 3 Recce Troops each with 2 carriers and 2 dingo scout cars. The support Squadron had 2 MMG troops with 4 Vickers on carriers, a troop with four 4.2" mortars and a blitz troop on motorcycles. In December 1944. The Division was sent to France to help with the Battle of the Bulge in the Ardennes and on Monday the 30th December the Airborne Armoured Reconnaissance Regiment was involved on the Meuse with the 6th Airborne Division with their Cromwells. By the 16th February, the Regiment left for the UK but left a tail, including the Cromwells, in Holland. The tail soon found out they were part of the ground force support of the next operation. 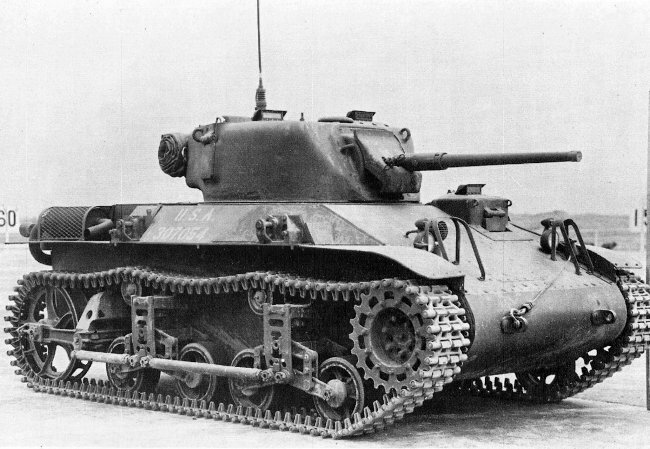 On the 24th March 1945, as part of Operation Varsity, 8 locust tanks were flown in by Hamilcars along with the troop of 4.2" mortars in Horsa's. In fact; less flew in ' Varsity ' than in the D Day drop. Although the operation was a great success, with the battle having been won by nightfall, casualties were very high and of the 8 tanks, only 2 survived fully serviceable. Several tanks and vehicles had been destroyed on landing and casualties were high. The rest of the Regiment had left on 17th march and joined up with the Airborne sections on the 26th. The Division continued the advance with the Airborne Armoured Reconnaissance Regiment well to the fore and on several occasions suffered severe casualties. Especially at a battle at Minden. On 30th April the Division reached the Elbe and on 3rd May elements of ' B ' Squadron met elements of the Russian Stalingrad Armoured Division. 2 days later the war was over and on 16th May 1945 the Division was ordered to return home, with the Reconnaissance Regiment leaving all its Tanks and Carriers in Germany. Training began for war in South East Asia but as the Japanese surrendered they were re-allocated to security duties in Palestine. The Regiment landed in Haifa on the 22nd October 1945 and worked as part of the division facing civil disobedience by both Arabs and terrorism by Jews. 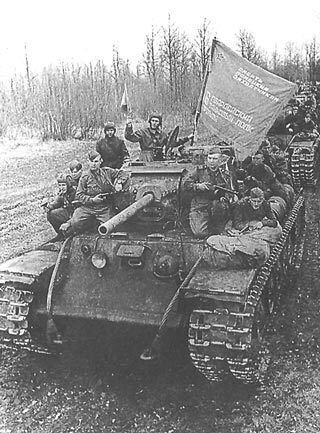 On the 1st February 1946 the 6th Airborne Armoured Reconnaissance Regiment was disbanded and most of the personnel were transferred to the 3rd Kinds Own Hussars which became a Reconnaissance Regiment.